Falling US Median Incomes - New Opportunities For Small Businesses? 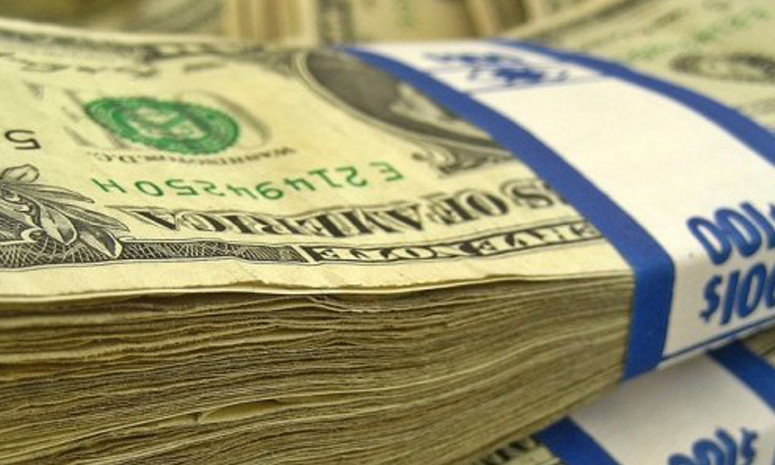 Falling US Median Incomes – New Opportunities For American Small Businesses? While income in real terms has reached its lowest point in 20 years, consumer spending has managed to reach higher levels compared to before the recession of 2007-2010. Falling US Median incomes seem to have to have no negative effect on consumer spending. On the contrary -despite disposable incomes dropping by 4% after adjusting for inflation – the lowest it has been since the 1950’s, Americans are buying a lot more than you’d expect. 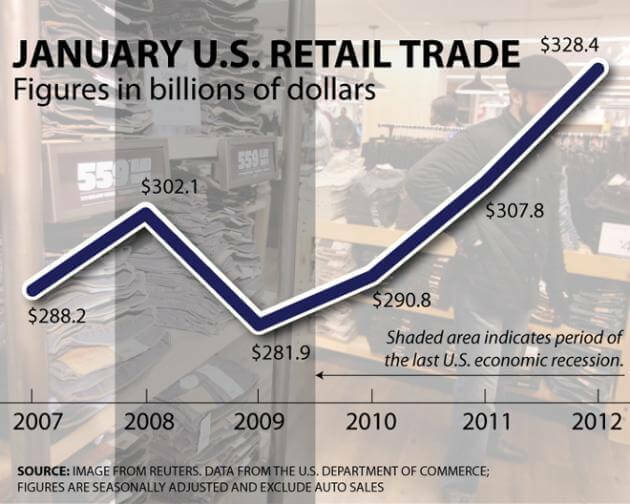 Check out this data from the U.S. Department of Commerce. Now compare this with precipitous drop in the Median US household income according to data from the US Census Bureau. Figures for 2012 have not been published and the graph data only covers up until the end of 2011. Bloomberg surveys have suggest incomes have continued to fall since this period. 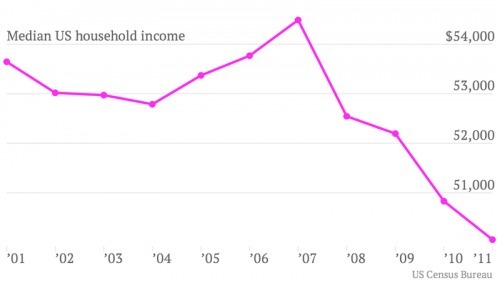 Despite the drop in real incomes, Americans as a whole are actually spending more. Reasons for this range from easy access to credit, as well as a psychological tendency for people to overspend once financial storms seem to have passed. Several studies have indicated that people tend to spend more freely if they have been have been feeling deprived. People are also more likely to overspend on credit, and if they have not actually held onto money in the form of savings. Whatever the actual cause for increased spending despite diminishing real incomes, this presents a lot of serious opportunities for small businesses that target the consumer market. Knowing what people are actually spending their money can help you plan business concepts and strategies, as well as help entrepreneurs identify areas of their own personal budgets to cut back on. CreditLoan created this interesting infographic that outlines what Americans spend their money – and credit- on. Suffice to say, falling median incomes and rising debts do not necessarily mean that it’s a bad time to start a business. Of course, this infographic does not really tell the whole picture. For instance, the cost of clothing has dropped significantly in the past few generations thanks to both mass production and outsourced labor. Food has similarly become cheaper thanks to technology and better distribution. In 1900, both food and apparel comprised around half of a household’s expenditures, with food almost tied with housing. By 2003, housing costs grew to a third of average household expenses and food and apparel together wasn’t even a fifth. People also ate out a lot less, didn’t have much technology to spend their incomes on, and had fewer opportunities to travel. Knowing what a family chooses to spend things on won’t tell you everything about the economic conditions and developments that lead it to be that way. Another thing to consider is that with credit so easily available, and with consumers so willing to spend, it may very well be the right time to start a business if you’re willing to take the risk.